When this client bought their new home they decided to gut renovate the kitchen. They had gorgeous custom millwork cabinets made. The cabinets were beautiful but they needed to be painted to really take them to the next level. It is a privilege to be entrusted with spraying these high end cabinet doors, drawer fronts and all the trim on the finely-crafted cabinetry. This job required 6 coats of lacquer, allowing it to dry completely before sanding for smoothness and enhanced adherence of the next coat. The owner chose Simply White in Satin finish for that fresh, classic appeal that crosses comfortably into a cottage style, sleek contemporary atmosphere or transitional presence. All the professional painters at Paintworks are trained and experienced in the particulars of cabinet renovation with the goal of exceeding customer expectations as well as protecting the indoor environment. Kitchen renovation is one of those home improvement projects that reaps dividends not only with homeowner enjoyment, but also return on investment (ROI). It is a wonderful, affordable way to take your kitchen from mundane to marvelous and keep your bank account with a positive balance. This client just moved into a new apartment and was looking for a way to brighten their kitchen. The cabinets were in great shape but the dark color wasn’t matching the new home vibe that they were looking for. We stepped in to paint the cabinets with Benjamin Moore White Dove semi-gloss to give the kitchen a quick makeover with minimal amount of disturbance for the client. The cabinets look brand new. We are always grateful for paint cabinets in Midtown East Manhattan. It's a bird, it's a plane. No, it's a plant, it's a mineral, it's a paint color! Jade the plant and jade the mineral are known the world over for its rich shades of lush green. And as a paint color, it makes a bold statement on kitchen cupboards in West Village. Here, among the historical buildings and hipster culture, one homeowner decided up raise the bar on kitchen renovation by having us at Paintworks & Decorating refinish the cabinet doors and drawer fronts in a jade green. It's a balancing act of protecting adjacent rooms, appliances, furniture and other kitchen accoutrements while covering the old finish with the new bright jade green. We are experienced in removing all the kitchen cabinet doors to an off-site location for this triple application of a lacquer kind of paint, while carefully handling the cupboard infrastructure or webbing and drawer fronts in the home. All the hardware and drawer pulls also get taken off and stored during the process. We sand lightly between coats on everything being painted, and this special paint then dries to a hard surface, adding to its lustrous look and smooth touch. West Village is the perfect place for jade kitchen cupboards for its eclectic style and multi-cultural population. Green is, after all, the most common color in the world for Mother Nature's presence, and what better way to bring a little of the outdoors inside? We thought the result was as stunning as some of the real estate prices in the neighborhood, but we also embrace the brilliant idea of protecting one's investment with a wild splash of jade green for refreshing a kitchen. One of the most stunning upgrades to a kitchen, without gutting it and spending the same as a new BMW 5-Series, is refinishing the cabinets. It can take mediocre to amazing with Paintworks & Decorating at the helm. This locally-owned, Big Apple-based company arrived at one Upper East Side Manhattan residence wearing their best paint pants with hand tools, power tools, masking tape and sheets of plastic, sandpaper and a sufficient supply of high quality Sherwin-Williams lacquer to get the job done. This project entailed removing 45 cabinet doors and drawer fronts, which were sprayed off-site in a multiple-step process. The kitchen appliances, floors and countertops were meticulously protected by masking in plastic. Paintworks & Decorating is intimately familiar with everything connected to paint, stain and lacquer, and for this job, sanding, spraying, curing to a hard finish and repeating twice is standard operating procedure. The lacquer dries to a hard finish which is incredibly smooth for the sophisticated process of diligently and evenly spraying, letting dry, then sanding appropriately, three times, for the sleek exterior [matte or glossy] that elevates the dull kitchen to a delightful, dynamic space -- after, of course, they carted all 45 doors and the drawer fronts back and perfectly re-installed them. Rather than remove this built in shelving unit, the new homeowner opted to fix the holes and repaint the whole thing in colors that fit them. They chose a vibrant color that makes the cabinets feel new and unique. Painting everything else with fresh white completed the transformation. 2 coats of Benjamin Moore Cabinet coat with sanding in between the coats allowed the paint to go on smooth and bond properly. Love painting cabinets all over Brooklyn and NYC. We love being the go-to Hoboken kitchen cabinet painter because the client is always speechless at the results. This client had recently replaced their countertop and was looking to update the rest of the kitchen to match the new modern vibe. We quickly removed all doors and drawers fronts so we could spray them off-site with multiple coats of Benjamin Moore cabinet coat. With careful sanding in between the coats we returned to paint the built-in cabinet webbing and reinstall the doors. The difference between the before and after is so drastic the client wasn’t even sure they were the same cabinets! As Hoboken kitchen cabinet painting contractors we have seen the impact a cabinet color change can make on the whole kitchen. We are proud of this project in particular because we felt honored to be the last step in the client’s kitchen remodel. Dated dark cabinets got your kitchen or bathroom feeling a bit gloomy? Professionally painting your NYC cabinets can brighten your room, your day, your life! Last month we had another great opportunity to help a homeowner revive her kitchen. The left side of the picture above shows the cabinets before being painted. The cabinets were dark, chipped, stained, and overall showing major wear and tear. Our first step was to remove all doors and front pieces of drawers to be sprayed off site. While the removable pieces were curing after their 1st coat we started to paint the webbing or built-in cabinetry. The client chose White Mountain semi-gloss as the new color. We sprayed 4 coats of Benjamin Moore Cabinet Coat sanding in between each coat to ensure proper curing and coverage of the wood grain. The client was stunned when we returned to reinstall the cabinet doors. She couldn't believe it was the same cabinets! We love painting cabinets in NYC because the transformation is always a fantastic reminder of what can be achieved with the right products and techniques. Local NYC cabinet painting contractors say consider painting before replacing! Transforming wood cabinets one home at a time. This time we were in the Hoboken / West New York area of New Jersey. The owner went with Benjamin Moore's Simply White for the cabinets and we think they turned out simply beautiful. Painting your kitchen cabinets is a quick way to brighten up your kitchen. No matter how dark your wood cabinets are or what kind of wood or veneer they're made out of, we can paint them. Considering painting your cabinets? Click here to schedule a free estimate. 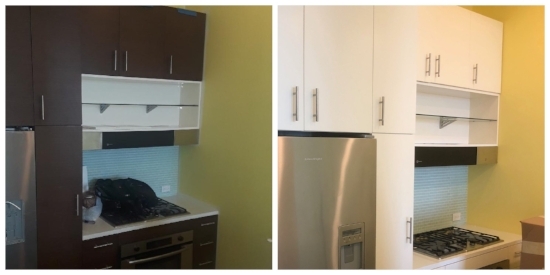 Last week we had the amazing opportunity to paint a few rooms and the kitchen cabinets of a gorgeous apartment near the water on Manhattan's Upper West Side. The apartment has beautiful molding and brilliant accents on the walls and ceilings. We were honored when they chose us to paint their place. We wanted the paint job to match this high-end classy apartment. The bottom picture shows the kitchen cabinets painted with Benjamin Moore Decorator's White. We strive to be the best painting company in the Upper West, NYC, and the surrounding area. We do this by giving anyone that calls us a free quote or free advice, honest and transparent answers from real people. We refreshed these Park Slope apartment cabinets back in early March this year. We sprayed each door with 5 coats of paint, sanding between each coat. We love how these turned out. So bright and renewed. The client chose elegant new hardware that definitely changed the vibe of the kitchen. Read more about our cabinet painting services in New York and New Jersey here.